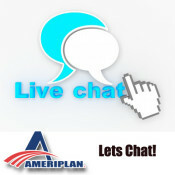 Have you used the AmeriPlan Online Chat? If you haven’t you should try it! The AmeriPlan support team is available on Chat from 8 am to 5 pm Monday thru Thursday and 8 am thru 4 pm on Fridays Central Time Zone. Either on your computer, tablet or cell phone, you can easily access our Online Chat and get quick answers to your questions. 1. Get to out Online Chat board. 2. Introduce yourself with a name or email. 4. Send a message and start your Online Chat experience! You can also access through your back office and the AmeriPlan APP/Online Widget. Chat is an easy way for BCs and Members to get quick answers to pertinent questions. Our customer service team will help you with any questions you may have or direct you to a person or dept. that will. Communication is KEY, so get connected and get your answers TODAY! Yes I did & I like it. It is better than waiting for a response by phone.